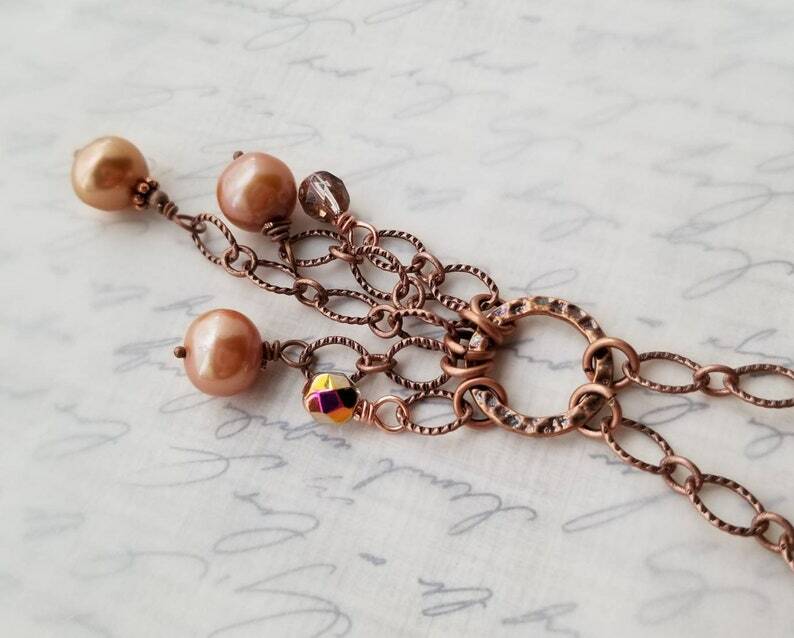 I had a vision last night of this necklace, a cascade of golden cultured pearls, faceted sparkling Czech glass and oodles of copper. Like? This tassel falls almost 3 inches from 30 inches of textured antiqued copper chain. It reminded me of crunchy autumn leaves and sparkling sun, of golden molasses and graham crackers, of old leather and books. You?? If you're like me, I know you'll want the coordinating earrings as seen in a few pictures above. You can add them here, too, https://www.etsy.com/listing/688581533/golden-brown-pearl-dangle-earrings-in? Beads are golden brown cultured freshwater pearls and faceted Czech glass. Wire is copper. Necklace as shown hangs 30 inches to the pendant and then another 3 inches. I did not add a clasp. Let me know if you need one.